A lot of impressions and previews pegged Divekick as a joke that turned into something more. I’ve never felt that way; I was able to play the prototype at Evolution 2012. This was the first year that indie games were featured at Evo, and none had a longer line than Divekick. Even in its prototype form, with 5 characters and no special attacks, there was a genuine hype. People chanting “Fraud” when someone triggered a Fraud Detection Warning, and the use of the “Fraud” stamp when someone was indeed outed as a fraud. Stepping up to the two-button controller, Divekick was no joke. You had to read your opponent as quickly as possible, and divekick him first. I was frauded that day, and though the ink of the fraud stamp has long washed off from the back of my hand, I have been eagerly anticipating the full release of Divekick. I happily backed its Kickstarter, but was pleased to find it had found a publisher. Information slowly trickled out since then, and though I’ve had the chance to play Divekick at various events before release, it’s now out on PlayStation 3, Vita, and Steam. One Joystick? Try No Joysticks! It’s been said over and over in previews and in other media, but it bears repeating again: Divekick is controlled entirely by two buttons. Not just the game, either, but the UI is controlled this way as well. On PlayStation 3 and Vita, the default buttons are the shoulder buttons, though these can be configured to your liking. On PC, you can use a joystick, and select two buttons, but your keyboard will actually work just fine. Select any two keys when you first boot up the game, and you are good to go. As far as the game goes, the entirety of the game can be learned in about ten seconds. Press the Dive button to jump into the air. Press the Kick button to kick down and at an angle. On the ground, press Kick to hop backwards. Press both buttons at the same time to do one of your character’s special attacks: One is done on the ground, and one in the air. Some characters are a bit more complex. Some can Dive twice before Kicking. Some can Kick twice after Diving. Ultimately, these differences simply serve to diversify the character roster. The game can be played by anyone since there are no execution barriers to anything; you cannot mess up a combo or a super move. The first hit wins the round, and matches are 5 out of 9 rounds. If the timer ticks to zero, whomever is closest to the center of the stage wins. 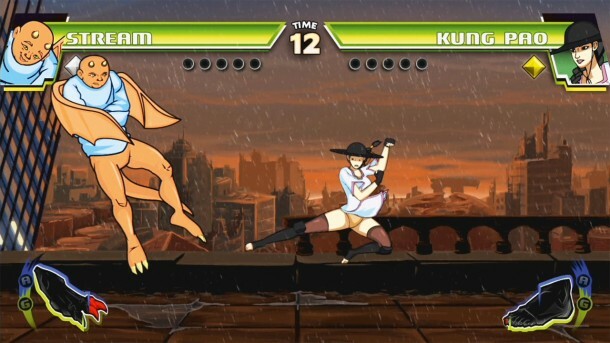 The additional mechanics of the game are only slightly more complex: Special moves cost some of your super meter to use. If your meter fills up, you enter Kick Factor, where you Dive higher and Kick faster. If you are hit on your head you will be concussed at the beginning of the next round, meaning you will lose all of your super meter and, for a short time, you will Dive lower and Kick slower. That is the complete list of game mechanics of Divekick. There is nothing else to know about the game. You’ll quickly learn about the different characters, and the way they Dive, Kick, and do Special Moves. Therefore, players will quickly move on from learning the game to learning their opponents. You’ll quickly see that in order to win, you have to get your opponent to move or position themselves in such a way that you can Divekick them. You’ll learn that you will have to read your opponent’s moves, while making or faking moves of your own. This is the essence of all fighting games – it just bubbles up to the surface here. This may be the greatest trailer of all time. It screams volumes about the attitude of the game, not just in gameplay, but in presentation. Divekick is a game that has a sense of humor about its origins in the fighting game community. First of all, right around when this trailer came out, divekicks themselves were seen as an extremely powerful move in Super Street Fighter 4 Arcade Edition, with Cammy players winning several tournaments. To have a whole game based around them was hilarious. “Can someone else run this bracket? I don’t feel like it anymore.” This win quote comes from an alleged incident where Marn stopped running a Guilty Gear bracket because he was busy getting high. “Instalock Mid!” When Mr. N gets Kick Factor, he sometimes shouts this, a reference to his play of League of Legends, and that he’s not 100% good at that game. “I don’t hug white girls.” As far as this win quote, apparently he said this once? As you can see, some of these are so vague that I don’t even get all of them. You’ll likely get even less of the jokes. Nevertheless, stuff like Jefailey, who is based on real life promoter Alex Jebailey, is just too funny in and of itself. He’s a character whose head gets larger after every win because of his ego. He also jumps higher when this happens because he is full of hot air. It’s one of those “If you know…” things where it’s either funny or it goes over your head. As for me, I find it blindingly funny and am reviewing it as such, but I understand if you don’t. At the very least, you’ll probably get the Fresh Prince of Bel Air references. I worry, though, that the humor comes at the expense of some of the presentation. While the characters don’t need to animate that much, since they all basically have one move, I feel like many of the characters are devoid of life. They are rigid and mechanic. I guess that’s on purpose since, again, they all have one move, but I don’t like it. I also feel like the backgrounds are plain and not very interesting. There’s minimal animation in any of them. 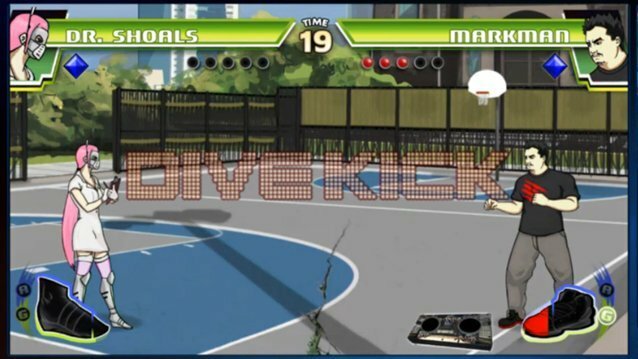 Divekick has a single player story mode with opening and ending scenes for each character, along with local versus play and online play on each platform. Local versus play is easy enough to do on PlayStation 3, and it’s not hard on a PC, since each player just needs 2 keys. Credit goes to the Vita version, which allows 2 players using just one system. Player one takes left and down on the d-pad as their Dive and Kick buttons, and player two uses X and Circle. 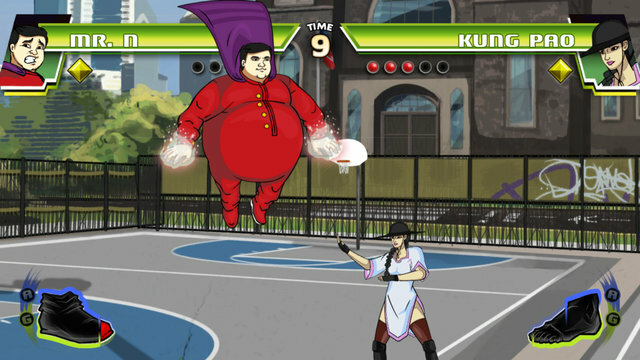 Online play is Cross-Play on PlayStation 3, with PlayStation 3 players able to fight against Vita players and vice-versa, whether they know it or not. Steam is limited to itself, but the game seems quite popular at the time of this review. Since many PC players might not own a joystick, there’s no execution barrier to entry here. The Online mode uses the smooth GGPO middleware, which has resulted in smooth matches for me no matter what the ping to my opponent is. On PC, you may encounter rollbacks if the performance of your computer is higher than your opponent’s. This information is displayed at the beginning of a match on PC, so you’ll know in advance what you’re in before. Divekick is a fighting game, through and through. It’s no joke, and it’s a lot of fun. It’s also a love letter to the fighting games that came before it and those that play them. At $10, and with Cross-Buy on PlayStation, I wholeheartedly recommend this, especially if you are particularly against fighting games, or wanted to play them but didn’t have a joystick, or any other number of excuses you may have. There’s nothing to hold you back here. Ted played Divekick on PlayStation 3, Vita, and Steam. He was not provided a copy of Divekick for review purposes. He completed Mr. N’s and Jefailey’s Story modes, and then played countless multiplayer matches. Previously, he played Divekick at Evo 2012, Evo 2013, and at E3 2013, where he frauded David Jaffe in a match. Later at Evo 2013, he got a poster signed by the development team, and on it was inscribed “You brag a lot,” in reference to frauding David Jaffe and Ted never shutting up about it. $8 with PS Plus for a few more days!